The All Aboard! Digital Skills in Higher Education project was launched during Digital Skills Week at the beginning of April. The project, funded by the National Forum for the Enhancement of Teaching & Learning, was a collaborative project between NUI Galway, University College Dublin, University of Limerick and Mary Immaculate College that aims to enhance digital skills in the higher education sector and beyond. 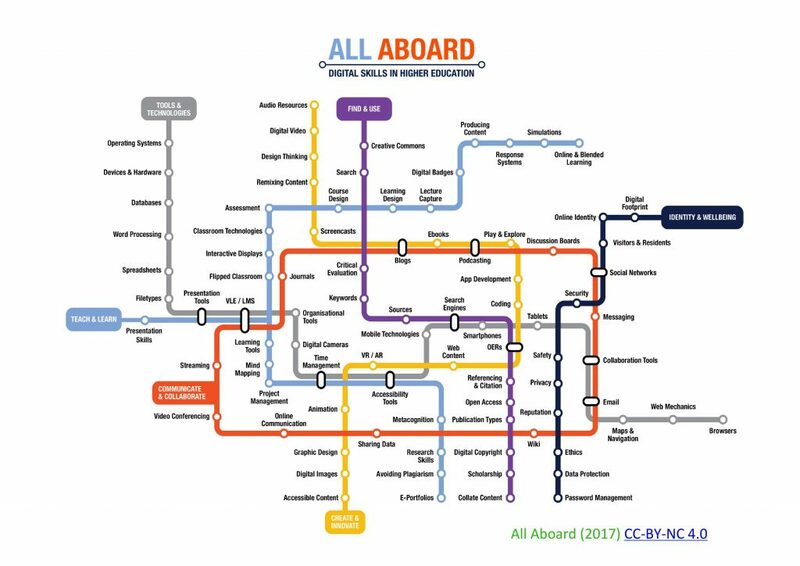 One of the cornerstones of the project is the Metro Map that uses thematic lines and the stations on those lines to categorise a plethora of digital skills. During Digital Skills Week, the project released their interactive lessons that cater to a wide variety of users, and are open resources for use and reuse. At the end of each lesson, the user can claim a digital badge for their accomplishment. These can be displayed in platforms such as LinkedIn to illustrate digital competencies. Students were also partners in the project through groups such as the Digital Champions at NUI Galway and UCD Student Digital Ambassadors. Students had the opportunity to lead and empower each other in helping to improve awareness and competencies related to digital skills. This project will prove useful across the education sector due to its open resources. Anyone can complete the lessons to earn a digital badge. Staff can use the lessons for CPD. Students can complete the travelcard scheme. The resources could be used during events like Tech Week Ireland. If you are interested in learning more about the project, visit www.allaboardhe.ie.